Only a handful of students escape the initial outbreak—among them Takashi Komuro and his childhood friend, Rei. He manages to protect Rei from the initial onslaught, but how long can Takashi and the other students hope to survive when the whole school—maybe even the whole town—is out for their blood?! 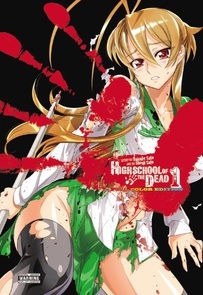 Enjoy the first four volumes of Highschool of the Dead in omnibus format, remastered in full color for this handsome deluxe hardcover edition!